I love making ice cream! While others may consider these crisp fall days as a sign to put the freezer bowl away for the season, I just shift gears and start considering seasonal flavors that can be incorporated into frozen concoctions. When I first tried pumpkin ice cream, I was hesitant. One would think that the warm flavors of pumpkin, nutmeg, cinnamon and ginger would be at odds with cool, refreshing ice cream. Strangely enough, it works very well. 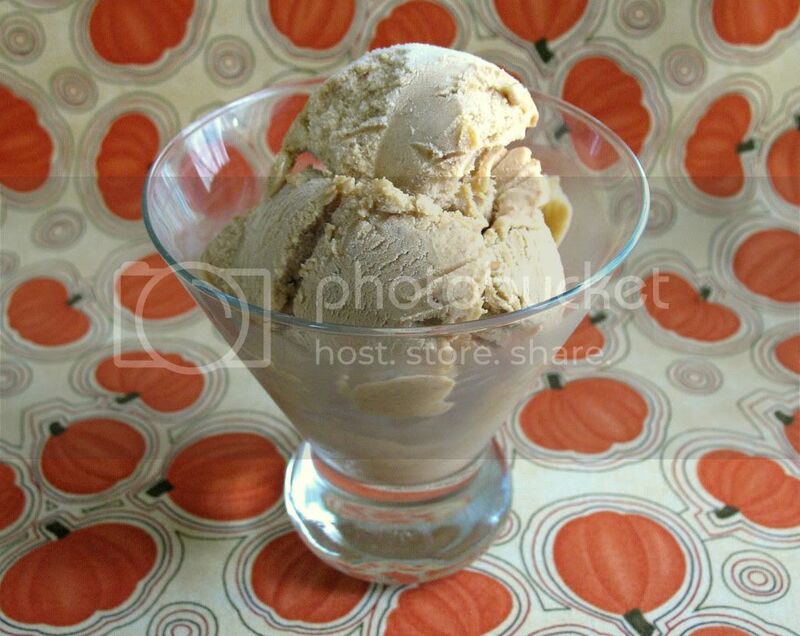 The ice cream is rich and creamy and tastes an awful lot like frozen pumpkin pie! The addition of pumpkin puree to the milk and cream base makes for a much thicker base. Because the base was so heavy to begin with, it churned for less time. This resulted in a denser, richer ice cream with less air incorporated into the final product. A little goes a long way! 1. In a heavy 2-quart saucepan over medium heat, combine 1 1/2 cups of the cream and 1/2 cup of the brown sugar. Cook until bubbles form around the edges of the pan, about 5 minutes. 2. Meanwhile, in a bowl, combine the egg yolks, cinnamon, ginger, salt, nutmeg, the remaining 1/2 cup cream and the remaining 1/4 cup brown sugar. Whisk until smooth and the sugar begins to dissolve. 3. Remove the cream mixture from the heat. Gradually whisk about 1/2 cup of the hot cream mixture into the egg mixture until smooth. 4. Pour the egg mixture back into the pan. Cook over medium heat, stirring constantly with a wooden spoon until the temperature reached 170-180. It will be thick enough to coat the back of the spoon and leaves a clear trail when a finger is drawn through it. Do not allow the custard to boil. 5. Strain through a fine-mesh sieve into a bowl. Add pumpkin and vanilla, whisking well to combine. 6. Cover with plastic wrap, pressing it directly on the surface of the custard to prevent a skin from forming. 7. Refrigerate until chilled, preferably overnight. Freeze in your ice cream maker according to the manufacturer’s instructions. The base will be quite thick, so you may want to whisk it before churning.